The last reigning Duke of Modena, Francis V, was born on this day in 1819 in Modena. He was the son of Francis IV of Modena and Princess Maria Beatrice of Savoy. After the death of his mother in 1840, Francis was considered by Jacobites to be the next legitimate heir to the thrones of England, Scotland and Ireland. 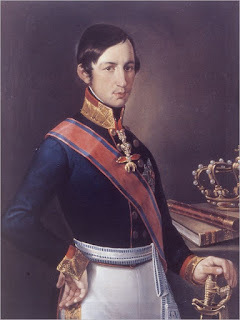 He succeeded as Duke of Modena in 1846 on the death of his father and also held the titles of Archduke of Austria and royal Prince of Hungary and Bohemia. During the 1848 revolutions in Italy, Francis was forced to flee from Modena after an uprising, but he was restored to his duchy backed by Austrian troops the following year. He had to flee again in 1859 after the duchy was invaded by the armies of France and Piedmont. In March 1860, the new King of Italy, Victor Emanuel II, ordered Modena to be incorporated into his new kingdom. Francis went to live in Vienna and died there in 1875. After his death, his niece, Maria Theresa of Austria Este, became the new Jacobite claimant. The Duchy of Modena and Reggio was an Italian state from 1452 to 1859. The Ducal Palace in Modena, which was built in the 17th century but not completed until the reign of Francis V, now houses a military museum and library. Modena has now become famous as the birthplace of opera singers Luciano Pavarotti and Mirella Freni. An obelisk was erected in Reggio Emilia, part of Francis V’s territory, to mark the Duke’s marriage to Princess Adelgunde of Bavaria in 1842.